JOIN US FOR BEGINNING WITH THE JUDY NIEMEYER METHOD! NOTE: This class is a prerequisite for the Dinner Dahlia Class, if you have not taken a Judy Niemeyer class previously. 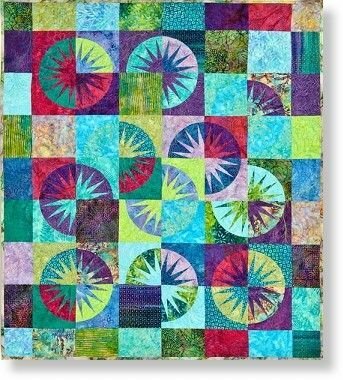 During this class you will learn beginning paper piecing as we all work on Judy Niemeyer’s Desert Sky pattern. Carol Jaynes, a certified Judy Niemeyer instructor, will teach you beginning paper piecing techniques, fabric choices, curved piecing and more. Whether you're new to paper piecing or have always wanted to make a Judy Niemeyer quilt this is the class for you! Pre-cutting the fabrics is a mandatory requirement prior to taking this course. Please begin preparing for class at least 2-WEEKS prior to the class to make sure that you are able to get familiar with your pattern and complete the pre-cutting beforehand. It is important that you have your pre-class cutting completed. If this step is not completed, you will have a difficult time keeping up and participating in instruction. We always recommend reading through your entire pattern several times before beginning. Fabric Selection: Choose 24 batik fat quarters, 12 bright textured batiks, ranging from light to medium, and 12 dark textured batiks, ranging from medium to dark. Preparing your Foundation Papers: Please read and follow the instructions for “Preparing your Papers and Templates” on page 2 of your pattern. Cutting Instructions: Follow the Cutting instructions on page 2 & 3 of your pattern. Place fabrics into the bags specified in the cutting instructions. Complete steps 1-5 on Page 3 of your pattern under “Stacking and Cutting Out Your Fabric”. Clip pieces together using large paper clips and place in the bags specified. Do not sub-cut the template sheets, this will be demonstrated in class. 2.5” wide Add-a-Quarter rulers of several lengths will be available for purchase from your Instructor at class.